Questions being raised by current research based on a foundation of over a century of geological studies pose a number of exciting directions for future work. At least four broad areas provide clear opportunities for significant contributions to our understanding of the midcontinent Permian: 1) climatic history of the midcontinent, 2) relationship between basement structure and tectonism to facies distributions, 3) source and diagenesis of Permian clastic sediments, and 4) prediction and delineation of systems tracts, meter-scale cycles, and lithofacies and associated petrophysical properties in a regional, three-dimensional framework. Enhancing our understanding in these four areas can best be accomplished through multi-disciplinary research involving chronostratigraphy, sequence stratigraphy, climate history, structural controls, and sediment transport and diagenesis. Further refinement in temporal control of the Permian section will provide important insights into many outstanding questions about midcontinent geologic history. The benefits of improved chronostratigraphy include 1) improved regional and global correlation; 2) better estimates of the temporal duration of sedimentary cyclicity and of the forcing glacio/eustatic fluctuations; and 3) the detailed calibration of paleoclimate records for better understanding the evolution of the Permian climatic system. An important step toward this end recently has been made with the biostratigraphic identification of the Carboniferous/Permian boundary within a well-exposed stratigraphic section in northeastern Kansas (Boardman et al., 1998; Sawin et al., 2006). The ongoing comprehensive biofacies analysis of the Virgilian and Wolfcampian interval, including conodonts, fusulinids, and ammonoids (Boardman, 1993; Boardman and Nestell, 1993; Boardman et al., 2009; and others), promises both an improved paleoecologic resolution and a more precise chronostratigraphy. In the absence of commonly occurring dateable ash beds, more sophisticated approaches are being used to improve the temporal framework of Permian rocks. Such techniques include the Rb-Sr dating of Mg-rich authigenic clays within evaporites (Long et al., 1997), and the U-Pb dating of pedogenic calcite (Rasbury et al., 1997; Rasbury et al., 1998). Another approach has been the application of high-resolution magnetostratigraphy to the study of rocks inferred to have a terrestrial origin (Molina-Garza et al., 1989). These methodologies, and others, are currently being actively pursued by a diverse group of researchers working on the Permian terrestrial succession of western Pangea (Tabor and Montañez, 2002, 2004, 2005; Tabor and Yapp, 2005; Tabor et al., 2002; Tabor et al., 2004; Tabor et al., 2008). The results of these and other chronostratigraphic studies will contribute to the adoption of the GSSPs for the Permian stages by the International Commission on Stratigraphy and their recognition in Kansas. Sequence-stratigraphic approaches applied to the midcontinent upper Carboniferous (Pennsylvanian) and Permian are those of Watney et al. (1995), Mazzullo (1998), Miller and West (1998), Boardman and Nestell (2000), Olszewski and Patzkowsky (2003), and Boardman et al. (2009). These studies are not limited to surface exposures, but are being extended into the subsurface. For example, large-scale, three-dimensional sequence stratigraphic-based petrophysical models are being developed to describe gas-bearing Wolfcampian strata in southwest Kansas, namely the Hugoton and Panoma fields. These models will provide new insights into the relationships between structure, deposition, and diagenesis of the pore-space distribution in these rocks. Using these reservoir models, large-scale fluid-flow reservoir simulations can be made that will be used to reconstruct the history of the gas that has been produced and help to predict where and how additional gas resources might be extracted. Results also will be useful in understanding ground-water transport. Calibrated models using strategic cores will also provide a perspective on the combined effects of tectonism, eustasy, and sediment supply. Sequence-stratigraphic studies of the Leonardian and Guadalupian of Kansas face some significant obstacles for future researchers. As emphasized by Sloss (1996), sequence-stratigraphic concepts and terminology were developed for rapidly subsiding basin margins with distinct shelf breaks. Slowly subsiding cratonic interior basins with ramp margins provide a very different tectonic and paleogeographic context. Several distinctions of cratonic basins discussed by Sloss are 1) lateral changes in subsidence rates of only centimeters per kilometer, 2) virtually horizontal sea floors with bathymetries of meters to tens of meters, 3) low rates of net accommodation of only meters per million years, and 4) low stratigraphic completeness of perhaps 10% or less. Clearly, with the very low accommodation rates on the craton, most time was not represented by active sediment deposition. Sediment aggradation was probably relatively rapid, followed by considerable periods of sediment bypass. Each well-developed paleosol profile within the variegated mudrock intervals probably accounted for up to tens of thousands of years. Determining the relative durations of these periods of nondeposition or subaerial exposure is difficult, but it is critical for recognizing regionally significant surfaces. A major problem facing the application of sequence stratigraphy in the midcontinent Permian is the difficulty in recognizing sequence boundaries in a cyclic succession with ubiquitous subaerial exposure surfaces (Miller and West, 1998). Maximum relative-lowstand surfaces would be expected to record the longest period of subaerial exposure on the shelf. Thus, a sequence boundary also may be considered equivalent to the most mature, and most areally extensive, paleosol profile in a vertically stacked series of paleosols. In some cases, a stacked series of paleosols or exposure surfaces will show a progressive upward trend from less to more mature. When recognized, such trends toward increasing paleosol development strongly suggest formation within a highstand systems tract (Martîn-Chivelet and Giménez, 1992; Wright, 1996). However, determining the relative maturity of paleosol profiles is a difficult task especially when they were developed under different environmental (climatic) conditions or were truncated significantly by subsequent flooding surfaces. Although we believe that marine transgressive surfaces provide the best basis for delineating cyclothems, the ability to recognize major episodes of relative lowstand is vital for correlation to basins outside of the midcontinent. Because of the many scales of cyclicity present in the section, different workers have recognized depositional sequences at several different temporal scales and have placed differing degrees of significance on specific boundaries. Any future consensus on these issues will require the development of criteria for determining the temporal magnitude of these cycle-bounding unconformities. The Late Paleozoic Ice Age (LPIA) has become increasingly important to those interested in pre-Quaternary paleoclimate (Soreghan and Montañez, 2008; Fielding et al., 2008). The major focus of climate modeling for the Permian has been the long-term climate trends associated with the assembly of Pangea and its northward migration. A major limitation to understanding the development of Permian climates at a higher spatial and temporal resolution is the general absence of extensive field-based data. The retrodictions of numerical climate models for the Permian have been tested principally against the global distribution of coals, evaporites, red beds, and eolian sands (Patzkowsky et al., 1991; Parrish, 1993). However, these geologic data are averaged over time periods that include multiple glacial and interglacial cycles and over which major shifts of climate likely occurred. Such time averaging also may be a factor in the disparities found between geologic data and model retrodictions (Taylor et al., 1992; Yemane, 1993). For these reasons, efforts are being made to model climate change associated with glacial-interglacial cycles (Kutzbach and Guetter, 1984; Kutzbach and Ziegler, 1993; Golonka and Ford, 2000; Gibbs et al., 2002; Hyde et al., 2006). A model developed by Peyser and Poulson (2008) suggests that aridification during the Permian-Carboniferous resulted from the combined effects of elevated CO2 and deglaciation. Further testing of such models requires additional high-resolution climatic data with adequate chronostratigraphic control as pointed out by Tabor and Poulson (2008). Widespread evidence for extensive glaciation occurs in Gondwanan sequences at high latitudes, but recent studies indicate glaciation at low altitudes in the Pangean tropics (Soreghan, Soreghan, Poulson, et al., 2008). Soreghan et al. 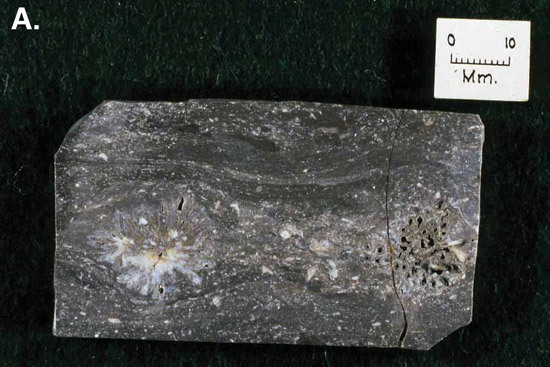 (2002) documented loessite from the upper Paleozoic in the Paradox basin and reviewed the occurrence of it in western equatorial Pangea (Soreghan, Soreghan, and Hamilton, 2008). Differences in the sedimentology, whole-rock geochemistry, and detrital zircon geochronology in meter-scale couplets of loessites and paleosols indicate changes in the relative humidity and wind directions between glacial and interglacial periods (Soreghan, M., et al., 2008). Evidence for equatorial glaciation in western Pangea at low latitudes and altitudes comes from polygonal cracking in coarse sandstones and gravels of the Fountain Formation in Colorado (Sweet and Soreghan, 2008) and from paleogeomorphological studies of Unaweep Canyon in Utah (Soreghan et al., 2007). A wide range of sedimentologic, mineralogic, isotopic, and paleontological data can provide useful proxies for climate (Parrish, 1998). Information on Paleozoic forest fires is providing information on the concentrations of atmospheric oxygen (Scott and Glasspool, 2006). A connection between climate, biogeography, and rates of evolution during the late Paleozoic is indicated by the latitudinal diversity gradients of brachiopods (Powell, 2007). Using fossil floras, DiMichele et al. (2008) reviewed the transition from wetland to dry land during the late Permian-Carboniferous, pointing out that the complex gene pool of plant species reflects climate at many different spatial-temporal scales. Results from Buggisch et al. (2008) using the stable isotopes in the apatite of conodonts suggest that there is some ambiguity between atmospheric CO2 and climate evolution in the late Paleozoic. Future studies are needed to test their results. Paleosols are one source of climatic data with great promise. Significant work has been done on Carboniferous paleosols (Joeckel, 1991, 1994, 1995) and more attention is now being given to the Permian paleosols of North America. The work that has been done in the midcontinent needs to be extended in both temporal scope and areal extent (Joeckel, 1991; Miller et al., 1996; McCahon and Miller, 1997). Such work is being pursued in the Permian of Texas and Oklahoma (Mack et al., 2003; Tabor and Montanez, 2002, 2004, 2005; Tabor and Yapp, 2005; Tabor et al., 2002, 2004, 2008). A great, untapped, source of climatic data for the midcontinent Permian is available from the stable isotope analysis of some invertebrate fossils and pedogenic carbonates. Based on the stable isotopes from well-preserved brachiopod shells, Grossman et al. (2008) indicated that the usefulness of such data for paleoclimatic purposes requires additional information on paleocirculation and paleosalinity of late Paleozoic epicontinental seas. The potential, and limitations, of using the stable isotopic composition of soil carbonate as a climate proxy has been extensively examined (Cerling, 1984; Cerling and Quade, 1993; Ekart et al., 1999). Some stable isotopic data have been collected from Permian paleosols (Joeckel, 1991; Kenny and Neet, 1993; Mack et al., 1993; Tabor and Montañez, 2002, 2004, 2005; Tabor and Yapp, 2005; Tabor et al., 2002, 2004, 2008), but a far more extensive data base will be necessary to contribute to our understanding of Milankovitch-scale climatic fluctuations. Another important factor in climate change that can be addressed by the stable-isotope study of paleosols is the partial pressure of CO2 (pCO2) level in the Permian atmosphere. Berner (1991, 1994) has modeled the evolution of Phanerozoic pCO2, and his model curve indicates an increase in pCO2 levels during the Permian. Such an increase would have obvious implications for forcing mechanisms for the Permian global-warming trend. However, the proposed trend in pCO2 has yet to be adequately tested by geologic field data. It has been demonstrated that carbon isotopes from pedogenic carbonates can yield useful estimates of atmospheric pCO2 (Cerling, 1992; Mora et al., 1993), and there are ongoing efforts to apply this tool to the testing of Berner's model (Mora et al., 1996; Ekart et al., 1999; Montañez et al., 2007). The Permian extinction events are often discussed in terms of late Paleozoic climate changes (Chumakov and Zharkov, 2002). Two Permian extinction events are recognized-one in the middle Permian (Guadalupian) and another at the end of the Permian-and both are attributed to release of massive amounts of methane (Retallack et al., 2006). No doubt climatic changes played a role in these extinction events, but they are probably only one of a number of interrelated causes. As discussed earlier, many local thickness and facies changes in the Permian section seem to be related to underlying basement structures. More attention needs to be given to the role of basement tectonics in controlling Permian sedimentation. On a shallow and very low relief platform, local tectonic uplift or subsidence of only a few meters would have a significant impact on sedimentation. At least two important directions for future research on this topic are 1) the improved seismic analysis of subsurface structures, and 2) the detailed mapping of thickness and facies changes at the level of meter-scale flooding surface-bounded units. Kilometer-scale 3D seismic volumes, increasingly utilized in oil and gas provinces such as Kansas, can be processed via different attribute models to resolve seismic facies and structural anomalies and, in turn, more closely examine possible causes and effects. Interpretations of deeper portions of the seismic data are markedly affected by complex dissolution of shallow Permian evaporites. Better understanding of the processes involved in evaporite dissolution, the so-called dissolution front, and the role of structure would be helpful to the petroleum industry and environmental concerns because the salt that subcrops in central Kansas-the karst plain between McPherson and Wichita-impacts water resources and integrity of surface facilities such as roads, railroads, and buildings. The latter data are critical for assessing changes in local topography with time, which provide clues to the magnitude and timing of local uplift or subsidence. Studies based on detailed drilling in and around Hutchinson demonstrated the major role of basement reactivation on deposition of the dolomites and episodic evaporite dissolution that may have enhanced fracturing of overlying strata along a lineament (Watney et al., 2003). Some high-resolution mapping along the Permian outcrop belt already has been accomplished for several carbonate units. This includes the classic work of McCrone (1963) on the Red Eagle Limestone, Laporte (1962) and Imbrie et al. (1964) on the Beattie Limestone, and Hattin (1957) on the Wreford Limestone, as well as the recent sequence-stratigraphic work of Mazzullo (1998) on the carbonates of the Chase Group. However, virtually no high-resolution work has been done on correlation and mapping within the clastic variegated units. The preliminary work that has been done in the Wolfcampian (Miller and West, 1998; Olszewski and Patzkowsky, 2003) provides promise that detailed correlation at a meter scale is possible within these largely paleosol-dominated intervals. Another important area for future work concerns the cause and timing of deformation within some stratigraphic units. Small-scale normal and reverse faulting occurs within at least some intervals of the Wolfcampian. In particular, the Easly Creek and Gage shales locally display extensive faulting as well as thick brecciated beds in Riley, Geary, and Dickinson counties (Miller and McCahon, 1999). The lateral extent of this deformation and its relationship to possible basement structure is currently unknown and such studies would help to provide analogs for use with subsurface studies where control is sparse. It also is unclear whether such deformation is largely syn- or post-depositional. The perception of the midcontinent as a tectonically stable platform overlain by flat, undeformed strata has probably discouraged tectonic investigations; however, the structural complexity of the Proterozoic/Archean (Precambrian) basement has affected the overlying sequences, including the Permian. An interesting problem, and one that has received little attention, is how clastic sediments within the Permian section were transported and deposited. Two general observations provide the framework within which this problem must be resolved. The first is the near absence of coarse-grained siliciclastics and the predominance of coarse silt to very fine sand throughout the Permian section. The second is the absence of channel or valley-fill deposits and the lack of any clearly alluvial facies in the lower Permian. The original depositional setting for the mudrocks and siltstones within the variegated units has been largely obscured by pedogenesis. Where pedogenesis is absent or weak, the mudrocks are generally either laminated or thin-bedded mudrocks with charophytes and freshwater ostracodes (Lane, 1964) or massive siltstones. The former suggests deposition in nearshore paralic environments, but the latter is suggestive of eolian sedimentation. An eolian origin may help explain the dominance of coarse silts to fine sands throughout the Permian section. Paleowind direction estimates from the extensive sand seas of the Permian are compatible with wind transport from the north and west into the midcontinent region (Parrish and Peterson, 1988; Peterson, 1988). Trace-element analyses of rocks from the Ancestral Rockies to central Kansas suggest derivation of the sandstones and siltstones from silicic source rocks of the uplifted blocks of Colorado and Oklahoma (Soreghan, Soreghan, and Hamilton, 2008; Soreghan, Soreghan, Poulson, et al., 2008), but a significant component of recycled sediment is found within the clay-sized fraction (Cullers, 1994). This is consistent with an eolian source for the silts and fine sands, with a different provenance for the clays. Future work on the mineralogy, texture, and distribution of siltstone beds within the midcontinent may help to confirm or reject this possibility. Because of the ubiquitous occurrence of paleosols, study of the pedogenic alteration of siltstones and mudrocks also presents a significant future research opportunity. The precipitation of pedogenic carbonate and sequioxides within the matrix, as well as the downward illuviation of clays, would have significant impacts on the porosity and permeability of clastic units. Bridging of silt and sand grains by illuviated clays may also affect the electric-log responses of subsurface units. The development of blocky and platy soil structures from an original depositional fabric also affects the mechanical durability of these units (Miller and McCahon, 1999). Understanding the character and extent of these different mineralogical, textural, and mechanical pedogenic changes has direct relevance to issues in hydrology, petroleum exploration, and engineering. An enduring problem has been the origin of the extensive chert beds and nodules of the Permian. The source for such a vast amount of silica is a major puzzle. Volcanic-ash deposits, if present within the Permian, are rare. Siliceous sponge spicules and radiolarian tests do occur in Permian rocks; however, it seems questionable whether siliceous sponge spicules and radiolarian tests alone would have been sufficient to provide the large amount of silica required. West et al. (1987) reported evidence of aggregates of gypsum crystal rosettes associated with chert beds in the Threemile (figs. 82A, 82B). 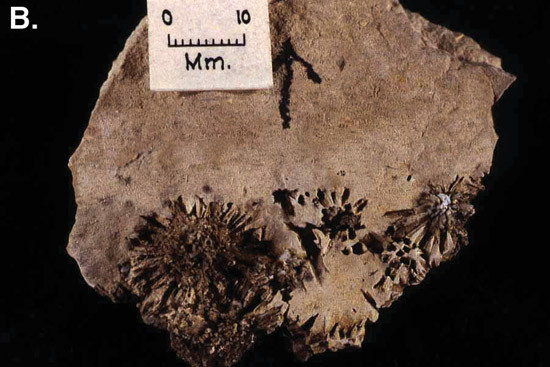 Twiss (1991b, p. 131) reported silicified evaporite rosettes and nodules as well as inclusions of gypsum and chert in the Schroyer and Florence limetones, in addition to the Threemile. Silica replacement of gypsum nodules occurs in other limestone units such as the Minkinfjellet Formation (mid-Carboniferous) of Spitsbergen (Eliassen and Talbot, 2003). The associated silica in the Threemile chert was length-slow chalcedony (West et al., 1987), which indicated replacement of evaporates (Folk and Pittman, 1971). West et al (1987) and Twiss (1987) suggested one possible source of silica for the diagenetic chert in the Permian limestones in Kansas was ground water enriched in terrestrial biogenic silica, including plant silica such as phytoliths. Figures 82A, B--Threemile Limestone Member. 82A, gypsum crystal-rosette molds in a chert bed, roadcut exposure on the south side of I-70, 5.6 mi (9 km) east of junction with K-177; near center E/2 sec. 29, T. 11 S, R. 9 E., Riley County, Kansas. 82B, gypsum crystal-rosette molds in the Threemile limestone from the east bank of a stream on Konza Prairie Research Natural Area; white area in the lower right is length-slow chalcedony; near center SE SE NE sec. 20, T. 11 S., R. 8 E., Riley County, Kansas.